Home > Blog > Heat Up Your Outdoor Space! Heat Up Your Outdoor Space! Fire outside can change everything. For centuries, we have been gathering with friends and family outside around fire. But what if you want to bring your outdoor game to the next level? Or just create the ideal oasis for yourself and your family? An outdoor fire feature in your outside living space can add the right touch to bring your space from comfortable to a sanctuary escape! With simple installation, natural gas and propane fuel selections, and many different options, you can create a personal paradise right in your own backyard! An outdoor burner is the easiest way to add an amazing focal point to your outdoor space. Simply place the burner into your own combustible enclosure, hook up the fuel line, and add your desired media! With many different styles and sizes, you can create your own unique fire feature by combining different burners together. All outdoor burners come standard with our Bulletproof Ignition System, which ensure the burners will light no matter what the weather conditions hold. Circle the burners around your patio or pool for the ultimate relaxation zone. Fire Tables are free-standing, fully-built enclosures complete with burners. Still with different styles, sizes and flame height options, fire tables are ideal for those seeking an outdoor focal point that is multi-purposed. Acucraft’s fire tables are large enough to be used as proper tables; the sides of the tables stay cool enough to have drinks placed on them without the drinks changing temperature. Fire tables can be made with different finishing options, media, and optional windscreen. You can create the ultimate fire table to mirror your taste and fulfill your needs! Custom Outdoor Fireplaces are free-standing or built into enclosures and naturally create a gathering space for friends and family. Our outdoor fireplaces are designed and built completely with you in mind. Custom outdoor fireplaces are a way to create something that is truly unique; something that will shock, inspire, and strike awe in all who get the opportunity to see it! Unlimited customization options give you the opportunity to make your dreams a reality. You will work with your personal Fireplace Advisor and Designer to discover what can bring your outdoor area to the next level! Seeking more information and inspiration? 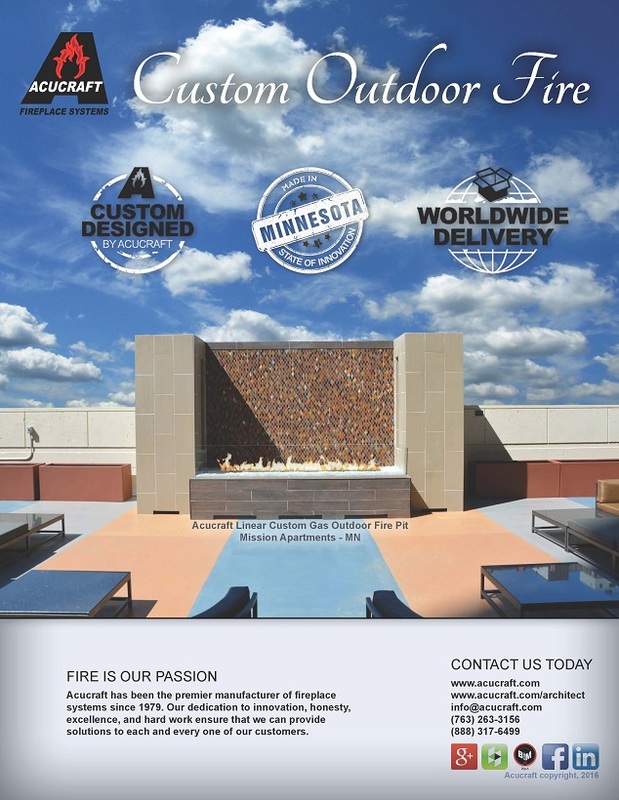 Request Your Outdoor Fire Burners & Tables and Custom Outdoor Fire Brochures Today!